I'm an Italian collector. 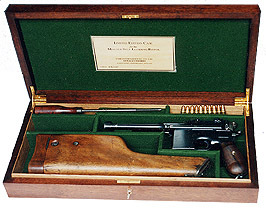 I proudly house my C96 Bolo in this presentation case. As you can see it's a fine handmade case. What you can't percive from a picture is the sensation of solidity and perfection which it convey to you and the smell of finishing wax mixed whith gun oil is simply aphrodisiac! When I open this box it make me fill a wealthy man from the thirties who can afford exclusive things!